Looking for a flexible data recovery software that will bring back all your lost files with just a simple click? CleverFiles Disk Drill is all you need. Try out this magical recovery software. Data security is at the top of the list of priorities for any organization or individual. And because most businesses or individuals do not backup all their essential data, loss of such vital info is all too common. With the right tools however, all lost data can be recovered successfully. CleverFiles Disk Drill is one such tool with an incredible power and capacity to retrieve just about any form of lost data. It is compatible with most types of storage devices. Memory cards, external hard drives, damaged hard drives, CDs, and DVDs are some of the storage devices that are supported by this recovery software. And not only that. You can also use it to recover data from USB thumb drives, mass storage devices, mass storage devices, digital cameras, laptops and desktops. With some 10M+ total downloads and 500K+ pro-clients, Disk Drill is the expert’s favorite recovery tool. It is available in 150+ countries worldwide and is available for windows operating system. With these and many other related statistics, now you know why this is among the most popular data recovery tools. Irrespective of the types of files supported by your system, this tool will be of great help. Some of the files formats supported include NTFS, FAT32, HFS+, and EXT. With this tool, you will be able to recover all file formats, even the very obscure types. Enjoy recovering your files fast and easy with just a few simple clicks. You are guaranteed up to 500MB disk space for all your files. Overall, this recovery tool is very affordable compared to other leading recovery software. It has an intuitive user interface that makes data recovery super easy for novices and professionals alike. For I just deleted then recovered, And BTW, their software a little slow. Overall is nice to use. The procedure for recovering files isn’t any different from what is available on other software; select, scan, and recover. Besides that, CleverFiles Disk Drill comes with very cool features that makes recovery a breeze even for the most inexperienced users. Moreover, this tool has a very friendly customer support who are always ready and willing to offer support round the clock. Disk Drill is the king of data recovery. It is feature packed and has a very simple user interface. Together with these, here are additional reasons why you need to check out this data retrieval tool. Can be used to recover deleted files, lost or formatted drives. Has licenses for individual use as well as commercial uses. Free as well as premium paid plans. The free plan supports recovery of up to 1GB of data. Quick and deep scans can search lost files and partitions and display what’s available for recovery. Has a multiple recovery algorithm that supports universal partition search and recover encrypted data. Recovery process can be paused, recovered, and loaded at a user’s convenience. It can be used to recover data from any device that can be mounted to your PC; internal or external drives, memory cards, cameras, USB flash drives, etc. Perfect Do It Yourself recovery tool that is simple and therefore can be used for individual as well as home data recovery. It has a 24/7 customer supports that is always ready and willing to offer help whenever possible. As aforementioned, this software is available for both individual and commercial use. Depending on your choice, there are different plans available. If you are new to data recovery or haven’t used Disk Drill before, it is advisable to try out the free plan first then with time, you can upgrade on any of the available packages. However, it is important to note that the free plan supports recovery of a max of 100MB. That said, let’s dive straight into the various Disk Drill plans that you can try out. This one is also used for basic data recovery procedures for Mac users. It comes with an annual license for a single user and supports a max of 3 computers. The annual plan goes for $7.42/month. Alternatively, one can opt for a lifetime package for $89.00 billed annually. This package has an annual plan that goes for $7.42 / month and can be used on a max of 3 computers. You can also upgrade to the lifetime package for $29/month or $89 billed annually. This plan can be used for both basic and advanced recovery. This is the last package plan in our list. It goes for $11.08/month and is ideal for basic as well as commercial data recovery. The monthly billing plan goes for a max of 3 years. Alternatively, one can choose to make a onetime payment of $399 for the lifetime package. Those are the different plans and packages. You can choose on any of these depending on the nature of recovery. This is best for individual use. If you want to recover some files from a damaged Drive, Memory card, Digital camera, etc. It is best suited for basic recovery procedures. The license is valid for 1 year and is charged at an affordable fee of $4.08/month. Alternatively, you can choose to upgrade to a lifetime package that goes for $49 annually. This package can be used across a max of 3 computers. This is another good basic PC recovery plan, though it can be used for commercial recovery as well. It comes with a lifetime license for unlimited users and PCs. It goes for $8.31/ month for up to 3 years. Users can also upgrade to the lifetime plan for $299.00. This is by far one of the most feature rich data recovery tools in the market. Here we will enlist just a few. Disk Drill also has a recovery vault that runs background processes that provide an additional layer of protection to HFS+, HFS, FAT, and FAT32 hard drive partitions. The vault ensures that you recover all the files with their original names and not generic names like is the case with most leading recovery software. Note that the recovery vault feature is only available on windows platform. Mac users can recover all their files with the original names without necessarily using the recovery vault feature. Recovering files with this tool also happen pretty fast. After scanning and previewing the files, you only need to tap on the recover button and begin retrieving all your files in one piece. Like file formats, this recovery tool is also compatible with a wide range of file systems. We have categorized these in terms of the supported operating system as well as storage drive. Like most data recovery applications, Disk Drill requires you to download and launch the application on a PC. After that, you will be prompted to choose a drive to scan. You can choose to scan the entire drive, a partition, or just sector. Disk Drill wizard has capacity to handle all that. However, scan option for folders and specific file types is not supported by this tool. You have the option to choose from the following scan options; quick, deep, and all types. The duration of time spent on all these is dependent on the scan option selected. Although needless to say, quick scan is faster than deep scan which is also faster than all the two combined. Combining the two does a good job checking your drive for lost files, though it takes much longer. Quick scan is best for recovering recently deleted files as well as unmounting drive partitions. Without having to use a recovery vault, this scan option recovers all your files with their original names. Deep scan on the other hand uses file patterns to reconstruct missing data. It works best for recovering files that were deleted long time ago. If your disk partitions aren’t responding appropriately, RAW volumes, you can also use this scan option to retrieve them. You can pause, save and even load scan sessions and resume whenever convenient. You can keep track of scan progress from the progress bar. When scanning process is done, you can use the preview bar to view and select the exact files you want to recover. This option is however not available for thumbnails. However, there’s the option files search which lets you choose on files by names or type of extension. Note that all intact files returned after scan are sorted by their file tree location while recovered deleted files ae availed in the recycle bin folder. With scanning over and done, you are ready to begin recovering the files you want to. And that is done by simply checking the “recover” button. That should prompt you to choose a location for keeping your recovered files. The types and size of files returned post scan determine the amount of time required to finish the entire recovery process. At the end of the session, you should be able to recover all your files. At this stage, if you do not wish to recover your files right away, you can choose to save the scan session. This way, you will be able to recover the files later. In order to evaluate the performance of Disk Drill, we undertook a number of test. We used a 1TB hard drive with a 200GB free space. In the first test, we used a 600GB partition, we created and deleted some files. The files were of different types; word, image files, and a videos file. In a separate test, we created a 20GB test partition, filled it up with different file types then deleted it. In the first test, we wanted to test the efficiency of the quick and deep scan processes. In the second test, we wanted to evaluate the efficiency of recovery of files and the types of files supported. The results for the first test were amazing and altogether surprising. As expected, the quick scan option took some 7 second while deep scan lasted slightly under 55 minutes. The full deep scan took much longer; 2.5 hours. For the second test, we managed to recover all the word documents, 95% of the image files and 98% of the video files. We also managed to recover 85% of the files that were deleted from the recycle bin. The deleted partition was recovered fully. Something else we noted during our performance testing is that this tool supports speedy recovery. In fact, it is much faster than some leading data recovery tools. Overall, Disk Drill performed excellently in recovering most if not all the test files. The speed, accuracy and efficiency were all beyond par. There are a number of advantages associated with using this data recovery tool. Some of these are enlisted below. It is powered by multiple data recovery algorithms that support NTFS, FAT32, EXT, HFS+ among other files systems. It supports data recovery across a range of devices and drives. It can be used to recover data from damaged hard drives, memory cards, digital cameras, etc. 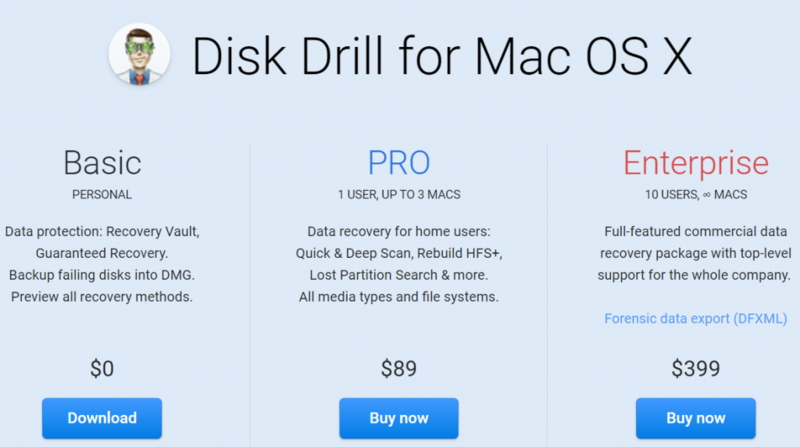 Disk Drill is built for speedy data recovery. It has a record fast scanning and retrieval speeds. It has an intuitive and user friendly interface that facilitates simple and quick data recovery. Supports up to 3 scan options; quick, deep, and combined scan. These ensure fast and accurate recovery of all types of file formats. Powerful scanning session management. You can save, pause and resume scan all at your convenience. It double as a premium data protection tool. The recovery vault tracks all your deleted files and keeps a record of the same. This makes recovery much easier and quicker. It comes with a mountable ISO/DMG backup for saving all your returned files after scan. This is handy especially if your do not intend to recover the files right away. Disk Drill can also be used to recover data from lost or damaged partitions. A set of healing algorithms and advanced partition recovery tools make it easy to recover data from any form of damages sector or partition. This is an affordable yet powerful data recovery software that is super-efficient and fast. If performance is anything to go by, we strongly recommend CleverFiles Disk Drill. Because of its simple design and user friendly interface, this utility can be used by apprentices and pros alike. CleverFiles Disk Drill is a feature rich recovery software that provides excellent data recovery. We have tested and used a couple of software before, but this one is in a whole new never of perfection and efficiency. If you are looking to recover some files you lost due to accidental deletion, damaged drive, or whichever other means of data loss, this is all you need. Disk Drill is ideal for basic as well as advanced data recovery. And because it is compatible with both macOS and Windows, this recovery utility is very popular, has a large user base of 500K+ pro clients and 10M+ downloads so far.